This combination made from pictures distributed by the FBI in 1964 shows, from left, Michael Schwerner, James Chaney, and Andrew Goodman, civil rights workers who were killed in the "Mississippi Burning" case of 1964. The men are going to be posthumously awarded the Presidential Medal of Freedom on Monday, Nov. 24, 2014, but the honor is not sitting well with some of their relatives. Photo Credit: The Associated Press, FBI, File. 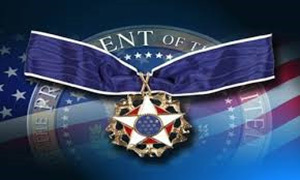 The Presidential Medal of Freedom being awarded posthumously to the three civil rights workers who were killed by Ku Klux Klansmen in 1964 makes some of their relatives uneasy. They worry it could relegate the racial equality movement to history books when it should instead be seen as relevant as ever, particularly in light of what happened in Ferguson, Missouri, where a white police officer fatally shot an unarmed black 18-year-old in August. A widow of one of the civil rights activists said the honor, which was awarded Monday by President Barack Obama in a ceremony at the White House, "distorts history." "There were not just three men who were part of a struggle. There were not just three men who were killed," Rita Schwerner Bender told The Associated Press in a phone interview from her law office in Seattle. "You know, the struggle in this country probably started with the first revolt on a slave ship, and it continues now." The civil rights workers - Michael Schwerner, James Chaney and Andrew Goodman - were killed June 21, 1964, in Neshoba County, Mississippi. The FBI launched a massive investigation that it dubbed "Mississippi Burning," and the three bodies were found 44 days later, buried in an earthen dam. Goodman's younger brother, David Goodman of Upper Saddle River, New Jersey, said the killings received intense national attention, from President Lyndon B. Johnson on down, because two of the activists, Goodman and Schwerner, were white. "It took (the deaths of) two white men to wake up white America what black America in the South particularly knew - that you could get murdered for your opinion or wanting to vote," David Goodman said. Schwerner, of New York, moved to Mississippi in early 1964 to work on black voter registration and other projects. Chaney, who was black and from Mississippi, befriended him. Goodman, who was also from New York, underwent civil rights training in Ohio before arriving in Mississippi. The three men drove to Neshoba County on June 21, 1964, to investigate the burning of a black church. As they left the church, a deputy stopped their station wagon, cited Chaney for speeding and took the three to the Neshoba County jail. The deputy released them late that night, and the men were ambushed by awaiting Klansmen who chased them to an isolated country road and shot them to death. In 1967, an all-white jury in Meridian convicted seven men on federal civil rights charges tied to the conspiracy to kill Schwerner, Chaney and Goodman. The state reopened an investigation decades later, and on June 21, 2005 - exactly 41 years after the slayings - a jury made up of whites and blacks in Neshoba County convicted Edgar Ray Killen of manslaughter. He remains in state prison. Chaney's sister, the Rev. Julia Chaney Moss, of Willingboro, New Jersey, said her older brother would always ask their mother: "'Why do we have to live this way?'" She said the award should be for all of those killed during the civil rights movement. "It's really about all of those families," she said. "It's really about the history of the pain of the African-American experience in Mississippi." The activists are among 19 people, including Stevie Wonder and Meryl Streep, who will be awarded the nation's highest civilian honor Monday. I think that awarding these men is right and wrong. I think it is right because it is shedding light on a situation that was awful and wrong. But at the same time this happened all the time back then and still happens today. Like the article said many people went through this struggle and the award should not be presented to one specific individual but to everyone that went through these awful acts of hate and violence. I agree that individuals should not receive this award, but at least the president is trying to shed some light on the issue and show that these types of acts should be rewarded. Everyone who fought for the cause should be given a reward, but it does somewhat encourage the selfless behavior that was shown. There are many others that rate this award, but there are almost too many to keep track of. What people don't talk about more often these days is what about the whites that help the other races? What about all of those good stories of love, not violence and hate? seems like our presidents like to take things the easy way. make yourself look heroic for this here award. While it is refreshing to see individuals get awarded for their courage, I do think in this case the statute of limitations would apply. I would also agree that it is also odd that these three are awarded, when there is known to be several others that could easily get this award. I find it odd that this is all coming out years and years later when the Ferguson incident is taking place. The President is being immature about this whole situation. He is even going against his former pastor of 20 years. It's all blowing my mind. A day late and a dollar short but better now, than never. It's a shame that ALL killed during this time, cannot be awarded a medal, but it's not realistic. These people deserve the award and it doesn't lesson the sacrifice and horror, of others. The families have a right to fee uneasy and I understand their pain. RIP to those who died. Are these actions and awards being awarded now because of what's going on in Ferguson? I truly believe in equality. I'm just disturbed in how the President is handling all of this. I think receiving this type of award says a lot but the fact that its being brought out now just shows how things are being played out. Why do groups of people that feel wronged have to act out instead of showing love? We live in a different world. The media heightens everything. What about all of the black on white crimes that take place? I do sympathize for the families that are involved with these deaths and awards. I sympathize for all of those families that are victimized by acts like these. We live in a fractured world and it's never going to be perfect or peaceful. There is hope found in our Lord, though. Instead of looking at the color of our skins when seeing people, why don't we look into hearts?